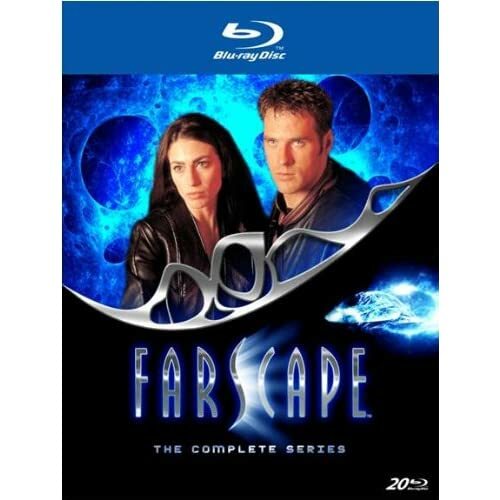 Just in time for the holidays, the entire Farscape series has been released on Blu-ray for the first time, with improved image quality and DTS-HD 5.1 Master Audio along with a bevy of bonus features. If you’re still happy with the previous DVDs though, there’s little reason to upgrade. This collection is identical to the 2009 DVD box set aside from the slightly enhanced video, more impressive audio and the inclusion of subtitles and one new retrospective bonus feature with the cast. Like the DVD set, the collection isn’t fully complete since it contains the show’s four seasons only and omits the later miniseries, The Peacekeeper Wars, but with 88 discs and assorted bonus features spread across 20 Blu-ray discs there’s more than enough entertainment value to keep the sci-fi fan in your life busy for a long time. For those unfamiliar with the show, it focuses on a US astronaut named John Crichton who stumbles into a wormhole during a test space flight, catapulting him into an unfamiliar galaxy populated with aliens akin to the Muppet and Star Trek schools of critter creation. Once there, Crichton falls in with a ragtag group of rebels on the run from a corrupt space police force called Peacekeepers. Crichton bonds with his new compatriots and they go on four seasons of adventures throughout the galaxy in their sentient, organic spaceship called Moya, experiencing love and loss along the way. As a product of the Jim Henson Company and co-produced by scion Brian Henson, the show utilized Henson’s Creature Shop to craft its intriguing puppet characters. Those include the spaceship’s pilot named…Pilot, a large multi-limbed critter who is bonded to the ship and acts as its spokesperson, along with the Yoda-sized Rygel, an old deposed ruler who bears the amusing ability of emitting helium when excited, resulting in some comical exchanges between the crew members. The other aliens on board are of the humanoid variety with heavy Trek-inspired makeup, led by the ferocious Worf-like warrior Ka D’Argo, the bald, blue-skinned female empath Zhaan (who also happens to be a plant), and the later arrival Chiani, a perky young gray-skinned thief and con artist. The only other virtually human regular character aside from Crichton is Aeryn Sun, a tough ex-Peacekeeper who gains compassion as the show progresses. The series originally ran from ’99-’03, and it’s showing its age in our current hi def world. It was shot in the old 4:3 format and although it was filmed rather than taped, the source material for this edition was PAL video masters, resulting in an image that is somewhat more crisp than the DVDs but shy of what one would expect of current HD quality. Where it excels is the robust new DTS-HD soundtrack, providing more sonic depth and immersion than previously available. It’s also a bit of a space saver in the home, decreasing the footprint of the previous DVD set from 26 to 20 discs in a noticeably smaller, slimmer box. 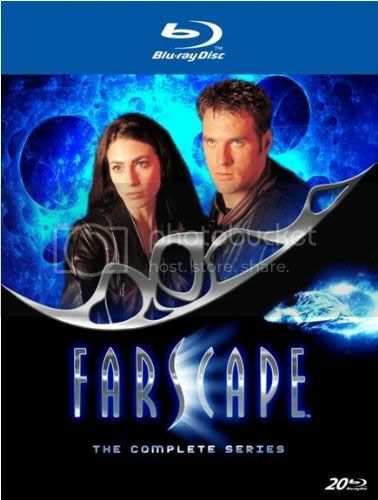 The returning bonus features include lengthy individual interviews with the cast members, a behind-the-scenes special called Farscape Undressed that originally aired between seasons 2 and 3 to get viewers up to speed on what had come before, featurettes on the villains, special effects, and efforts to save the show, deleted scenes, and some original TV promos. The sole new feature is Memories of Moya: An Epic Journey Explored, a recent interview with the cast and creators where they reflect on the legacy of the show. While it’s great to catch up with the cast, it’s not a large enough incentive to make the set a must-have purchase over DVD for even the most obsessive of fans. Still, if you’re not already a DVD box set owner and you’re going to buy the series anyway, the new Blu-ray set is clearly the way to go. Hard to believe this is the first time we've covered Farscape Steve, and great job as always in bringing the goods !